Total Commander is a multi-window file manager for Windows which uses tabs for better organization. Windows includes by default the Windows system Explorer to manipulate files an directories. As the vast majority of tools that come by default in Windows, this browser plays its role, but does not offer a neat usability or a set of utilities that make this tool essential. You may think that to do tasks with files such as copy, paste, move, unpack, etc, is somewhat slow, cumbersome and even complicated. It is possible that we have this idea because we are not using the right file manager. To make this kind of task, and more, we recommend Total Commander, which may be the King of Windows file managers. The main screen is divided into two panes, and each pane will have a file Explorer. We can move/copy files and folders from the left side to the right side and vice versa, accelerating this way the copy/paste process. In addition, multiple tabs can be opened by pane, so we can have many locations opened on our PC, and we can manage files between them in a fast and simple way. We can even add directories to our favorites and access them from the panes. Also we have quick access on each pane to view the history of directories that we have visited. In each pane you can easily change to other drives, see free drive's space, or go to drive's root directory. For those who know well MS-DOS commands, or for the most nostalgic, we have a text box at the bottom where we can enter MS-DOS commands. The files and directories are selected by dragging the mouse with the right button pressed, so we can quickly select the files that we want to manipulate. 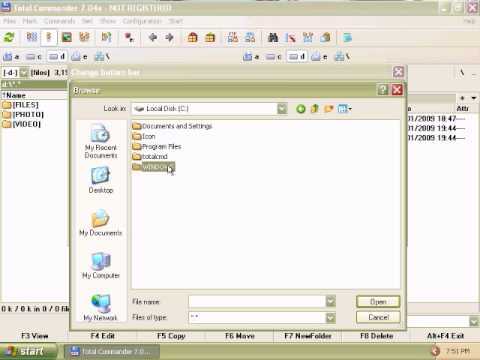 We not need to use an external interface to unzip files, since Total Commander can browse through the compressed files as though they were directories and, therefore, we can unzip the files by selecting them and dragging them to a different location. If we want to continue to use the program while copying files, we can send the copy provess to background, and continue using the program to make other tasks. We can also create a queue of copy processes that are executed one after other. With this program we can make advanced file searches, since we can use regular expressions and recursive search. In addition, it also allows to make search in the file's content, so we can find, for example, the text "license" in all files of a given directory, or one or several units. It also offers the possibility to rename files using patterns so we can rename in batch. We can easily mount a network drive or FTP addresses thanks to the FTP Manager which is included. There are more options such as: Association internal and external extensions, directory synchronization, comparison file's content, file encryption, and more. The use of this software is simple, although at first sight it may seem complicated. Thanks to the multitude of options, we can forget other additional programs to make tasks that we can already do with Total Commander. The software has been on the market for more than twenty years and in its early years, it was called "Windows Commander", which later had to change because of a "complaint" from Microsoft. The program is paid and offers a 30 days demo where we can prove it without any limitations. After those 30 days we must delete the program or purchase a license. If we decide to continue using the program after 30 days without buying the license, the program will remind us that we must buy a license every time we initiate it. Usitility team has been using the program since it was called Windows Commander and we can do nothing but recommend it strongly to all users, both novice and expert.